Product prices and availability are accurate as of 2019-04-20 14:16:10 EDT and are subject to change. Any price and availability information displayed on http://www.amazon.com/ at the time of purchase will apply to the purchase of this product.
? In this Advanced Hyper-V Implementation and Management training course, expert author John Savill will teach you how to architect and deploy Hyper-V deployments. This course is designed for users that already have experience with Hyper-V. ? 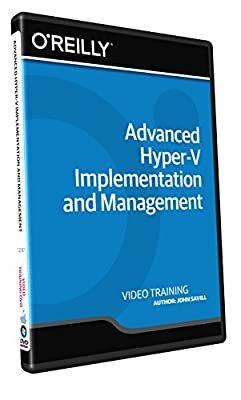 You will start by learning about advanced networking and virtual storage with Hyper-V. From there, John will teach you how to create and use Hyper-V templates, including how to manually deploy virtual machines for Hyper-V, install Hyper-V integration services, and use MVMC. This video tutorial also covers tuning and resource management with Hyper-V, failover clustering, and Hyper-V live migration. Finally, you will learn how Hyper-V fits in a remote desktop services solution. ? Once you have completed this computer based training course, you will have learned advanced concepts for implementing and managing Hyper-V.